So I didn’t pay much attention to it. I was just focused on the news story I was working on, letting tomorrow worry about itself. I was about to head home for the day, when a coworker told me I was lucky to be on tomorrow’s shoot with Mr. Burrell. I admitted I didn’t know who he was. My coworker grabbed his pants, pretended to pull them up, did a little spin, and started moon walking. He stopped, looked at me, and said, “can’t touch this.” MC Hammer. Hammertime. Rap icon. The first tape I bought as a child. Well, my parents bought for me technically. 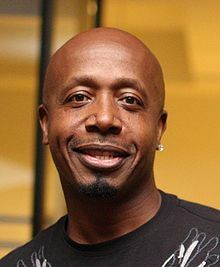 I loved MC Hammer. I used to wear this black and red jacket, with a white stripe down one side, and dance on our tile floor with socks. I called it the ” MC Hammer jacket.” I would announce that it was hammertime, spin and jump, moon walk (in an eight year old way), lip sync every word. I loved that tape. Granted, my parents probably shouldn’t have bought me the tape, but I turned out alright. There’s an unsaid rule regarding interactions with celebrities. No autographs. No pictures. Be professional. We break those rules occasionally, but generally we never initiate interaction other than what should be said and done in a professional setting. I’ve met a lot of famous people, and I’ve never asked for autographs or pictures. Third Day, Brad Paisley, Jennifer Garner, the list goes on; people that would look great with me in my profile picture on Facebook. But I keep it professional, per the rules of star engagement. But I was willing to break all the rules with MC Hammer. I had to. My first tape. My introduction into the musical world as a child. Everyone has a first tape/CD/album story. I was going to meet mine, and I had to at the very least walk away with a signature. And what would be cooler than having him sign that first tape, my first tape? Nothing. The cover of "please Hammer Don't Hurt Em.'" My first tape. One problem though: the tape sits in a childhood box in Colorado at my parent’s house. Not enough time to ship it. Plan B. I’ll find that same tape to purchase somewhere around Hampton Roads, where I live. Bad news: no one sells tapes anymore. Forget the fact I needed the rare tape “Please Hammer Don’t Hurt Em'” from 1990. I was determined though. I had an empty evening, a full tank of gas, Google, and a phone book. I created a list of fifteen used music stores. I narrowed that list down to three, the only three that sold used tapes. After making phone calls I narrowed the list to two. One store said they had MC Hammer tapes, but it was a music trading store, so the store’s collection was always changing. The other store said they had some old MC Hammer records, and they likely had tapes too. Likely wasn’t good enough. I went with the used music store. The music store closed at 8PM. It was 6. Rush hour in Hampton Roads is like waiting in line for the Matterhorn at Disney. The store was in Newport News, an hour drive with no traffic (which doesn’t exist). I hopped in my gray Sonata and sped over the Hampton Roads Bridge Tunnel, fighting traffic and taking every local shortcut I knew. I pulled up at 7:45PM. The shop was in, well, the ghetto. It was run down, had an old red tin roof, and the windows had a faint yellow stain from too much sun. Two guys sat inside, one old and one young. It reminded me of that John Cusack movie, High Fidelity. Old records sat in huge piles, tapes mixed in with CD’s. There was no system of organization. A punk kid stood in a far corner holding an old Green Day album. I didn’t have time to dig through the dust. I needed to find it before they closed. These audiophile’s faces revealed an air of pride and superiority, and I knew asking would be the fastest way to find it. 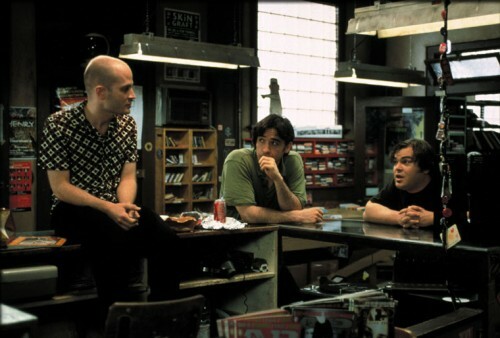 A still from the movie "High Fidelity." 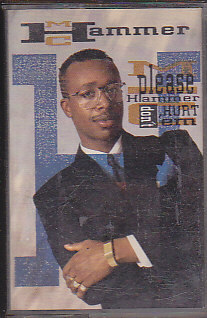 At this point, I was willing to accept any MC Hammer tape I could get my hands on. I wanted his “Please Hammer Don’t Hurt Em’,” but I wasn’t too picky at this point. I solicited their help. I told them I was interviewing Hammer tomorrow, and that I wanted him to sign my pretend “first tape.” Their eyes lit up. They had a mission worthy of their audiophile’ness. Dust rose in the air as we started digging through old piles of albums and tapes. Occasionally someone would get excited, but end up pulling out an old LL Cool J tape. I started to lose hope. And then I saw it. MC Hammer’s “Too Legit to Quit” tape. Not the one I wanted, but at this point I had to take what I could get. I tried to look excited, but I guess the disappointment on my face was visible. The older of the two employees told me to follow him. He led me into a back room behind the register, filled with carefully packaged albums and tapes. This room was even darker, even mustier, but it had shelves and shelves of tapes and albums. This was not part of the music store, this was special. The man ran his finger over a shelf, tracing the alphabet with his finger. It stopped on M. He pulled out the exact MC Hammer tape I wanted. Almost brand new. “From my personal collection,” he told me, handing it to me. I told him I couldn’t take it from his collection. He insisted. And he charged me what the other MC Hammer tape cost, the used one. Three dollars and fifty cents. I gave him a five dollar bill. The next day, while I was lighting for the interview, my cell phone rang. Over the phone, a senior producer told me that Mr. Burrell had missed his flight, and they had canceled the entire appearance. Sad, I turned off the lights and started to tear down the gear. I took the tape out of my pocket and put it into my backpack. I wish the story ended with MC autographing it, and laughing as I told him about my childhood dancing. But it didn’t. I was told they would reschedule it for the future, which they haven’t done yet. And so the tape sits. Its on my dresser at home, unsigned, collecting dust just like it did at the music store. I debated returning it to the music guys, but its been over a year now. Every time I hear his music on the radio I smile though, and remember how close I came to actually pulling it all off. This entry was posted in behind a camera, CBN, Entertainment, Personal and tagged autograph, behind a camera, behindacamera, blog, blog behind a camera, CBN News, Hammer, interview, MC Hammer, Please Hammer Don't Hurt Em', radio, ryan johnson, signed please hammer dont hurt em', signed tape, Stanley Burrell, tape, U can't touch this by Ryan Johnson. Bookmark the permalink. I love this story. I really is one of my favorites. I remember talking to you as you drove out there. The determination in your voice was acute. What a great story you have. Now, if I could only find that tape of you dancing to this as a child, my life would be complete! Great story, you’ve got to get there and do these things sometimes.